This section includes a descriptive listing of words relating to periods of time. All terms are defined in two separate lists: first by number referred to, then alphabetically. This section includes an overview of the evolution of calendar systems throughout history and throughout the world. This section shows the relationship among various calendar systems, including Gregorian, Jewish, Hindu, Jain, Buddhist, Sikh, and Burmese calendars. This section explains the importance of the moon to the world's religions and includes charts that show the phases of the moon. This section provides basic information about the world's major religions, including when and where originated, founder(s), theological orientation, major sacred texts, denominations and sects, estimated number of adherents around the world, and a listing of the main holidays in chronological order by the religion's calendar. This section lists for each of the 50 states: the date of admission; information about observances, if applicable; state nicknames, mottoes, animals, flowers, and other symbols; reference sources noting the admission day; and selected state offices to contact for further information, including web sites. For territories, listed are year of association with the U.S.; nicknames, mottoes, flowers, and other symbols; and web sites and offices to contact. This section lists legal public holidays in each of the states, the District of Columbia, the Commonwealth of Puerto Rico, and the U.S. territories. This section includes tourism information sources for the United States, Canada, and Mexico. This section lists all U.S. presidents in the order in which they held office, their birth dates and places, spouses, death dates and places, burial sites, political parties, nicknames, and career highlights. It also lists notable landmarks commemorating them, along with contact information and web sites. This section provides basic information about the independent nations of the world: official name (in English); capital city; internet country code; flag description; national anthem, motto, and symbols (when available); geographical description of location; total area; brief climate description; proper terms for nationality; population numbers; languages spoken; and information on ethnic groups and religions. This section lists legal public holidays around the world in alphabetical order by country. 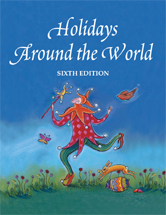 This section includes tourism information sources for countries around the world, except the United States, Canada, and Mexico (see Appendix 8). The listings are in alphabetical order by name of the country. This section includes an annotated listing of sources cited or consulted in HATW, as well as other sources for further reading. The Fixed Days and Events Index organizes holidays according to the month or specific date(s) in which they are observed. For each month, those holidays celebrated within the month are given first, followed by holidays celebrated on specific date(s), then those observed at the same time each year, although not on a fixed date (e.g., the first Monday, the last week, etc.). The Movable Days Index organizes events according to the dates of non-Gregorian calendars, including the Jewish calendar, Islamic calendar, and the Hindu and Buddhist lunar calendars, or movable Christian holidays that depend on the date of Easter. Indexes festivals and events that revolve around the enjoyment, appreciation, and celebration of an art form such as fine and decorative arts, music, dance, film, literary arts, or theater. Indexes festivals and events that deal specifically with the calendar or that are held in celebration of the time of the Year (solstices and equinoxes), the beginning and end of seasons, etc. Indexes festivals and events deeply rooted in folklore and tradition, as well as those celebrating specific folk tales or myths. Indexes festivals and events that revolve around the celebration or preparation of foods, the harvest or promotion of a particular crop, or a type of cuisine or style of cooking. Indexes festivals and events commemorating specific events from history, such as battles, national independence, the birth dates of famous people, etc. Includes festivals and events that promote everything from city, state, and national pride to agricultural products; from activities (film, quilting, rodeo) to social values (conservation, harmony among people). Indexes festivals and events that are part of the customs and practices of a faith tradition, that commemorate events from history of religious significance, or are focused primarily on religious worship services and celebrations. Indexes festivals and events that are based on or revolve around sporting events. It does not include the many fairs and festivals in which games and contents form only a part, although these events can be found in the General Subject Index.